Chart Wealth... Cyclical Index Keeps Rhythm With Market! July 2007, Volume 4 Issue 3 Know It - Profit! In this issue, Johnson Controls Inc. leads the AMEX Morgan Stanley Cyclical Index to new highs. Also, will oil prices get capped? Or, will they continue to gush profits for the oil service sector? Find out in this edition of Chart Wealth! All the major indices continue to climb higher. 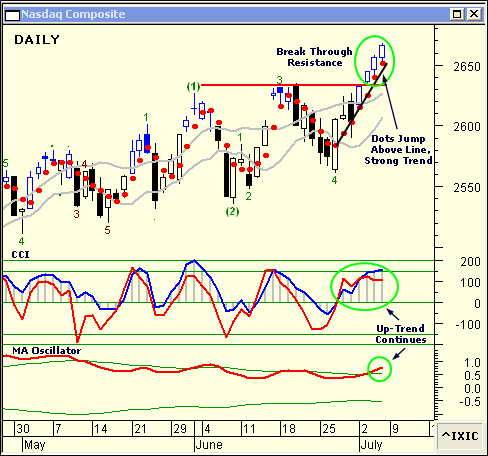 With its resent break through June resistance, the Nasdaq seems poised to continue higher... but, how much higher? The P&L Dots have jumped above the line of departure, revealing the power of the break-out. And, the CCI and the MA Oscillator confirm the continued strength of the trend. However, the Elliott short-term fifth wave and the intermediate third wave are approaching a coincidental termination point. The PHLX Oil Service Sector Index (^OSX) is still drilling ahead. Can a top be near? 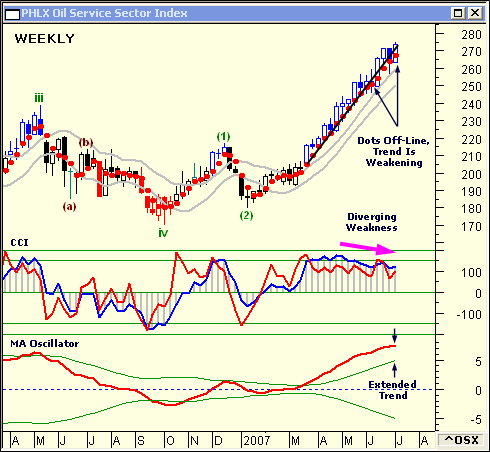 The weekly chart of the Oil Service Sector shows some technical weakening. First, the P&L Dots have dropped below the line of departure, showing a general slowing of momentum. Next, the CCI has been diverging from price for the past 10 weeks. Finally, the MA Oscillator has become over-extended... beginning to turn down towards its volatility bands. Johnson Controls Inc. (JCI) is a component stock of the AMEX Morgan Stanley Cyclical Index. Headquartered in Milwaukee, Wisconsin, JCI is an automotive interior experience, building efficiency and power solutions company. 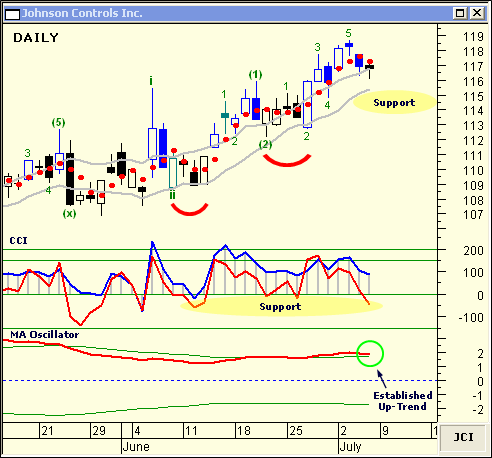 The daily chart of JCI reveals a steadily advancing stock... methodically moving through each Elliott wave. The CCI shows the upward trend will continue to be supported. The volatility bands of the MA Oscillator have begun to fan-out, again... maintaining the momentum of the advancing trend. Summer in the US means family vacations and time away from home and the markets. If you're going away on holiday, enjoy a well deserved break. Use the down-time to re-evaluate your trading plans and to develop new investing strategies. Then, come back to the markets... ready to trade!